Daniella (All About Manga) Orihuela-Gruber is picking up the baton of the Great Manga Gift Guide, and I thought I’d take the opportunity of the One Piece Manga Moveable Feast to offer a shônen-flavored version that takes One Piece’s tone and content and creator Eiichiro Oda’s career arc into account. Now, many shônen series are great, but they’re just plain long, so it’s with some reluctance that I would suggest them as a gift when, if the gift is received well, it would require the recipient to spend a ton of money completing a series. That’s very “first hit’s free,” don’t you think? But sometimes that kind of recommendation is unavoidable, and since this list is conceived at least partly with the One Piece admirer in mind, I’m not going to be too rigid about it. I will be rigid about one thing: use what you know about the recipient to guide your choice of gifts. If you know they like comics, great. If you know you want them to like comics, tread carefully, and pair the comic gift with something you know they actually like. Holidays are always creepy when they’re tinged with evangelism, I think. It’s widely known that Oda took great inspiration from Akira Toriyama, so it seems reasonable to recommend Toriyama’s Dragon Ball, which is available in bulky, gift-worthy VizBig editions. 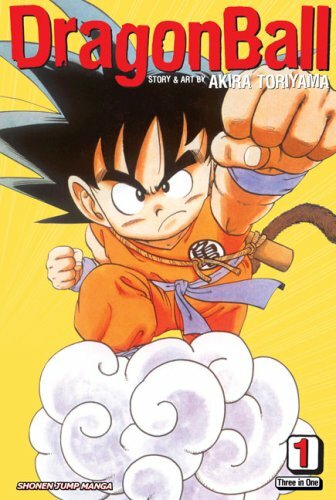 It offers “a wry update on the Chinese ‘Monkey King’ myth, introduces us to Son Goku, a young monkey-tailed boy whose quiet life is turned upside-down when he meets Bulma, a girl determined to collect the seven ‘Dragon Balls.’ If she gathers them all, an incredibly powerful dragon will appear and grant her one wish. But the precious orbs are scattered all over the world, and to get them she needs the help of a certain super-strong boy…” Less adventure and more jokes can be found in Toriyama’s Dr. Slump (Viz). Toriyama and Oda have collaborated on a Dragon Ball/One Piece crossover called Cross Epoch. Oda began his career as an assistant to Nobuhiro Watsuki, who was working on Rurouni Kenshin (Viz) at the time. 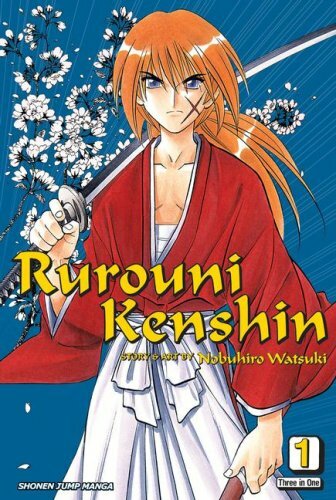 Viz declares, “Packed with action, romance and historical intrigue, Rurouni Kenshin is one of the most beloved and popular manga series worldwide. Set against the backdrop of the Meiji Restoration, it tells the saga of Himura Kenshin, once an assassin of ferocious power, now a humble rurouni, a wandering swordsman fighting to protect the honor of those in need.” It’s also available in VizBig format. 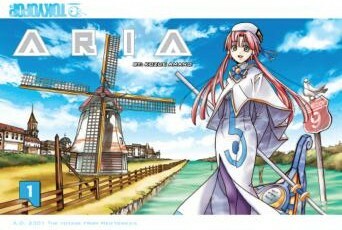 If you liked the whole “travel by water” notion and were particularly taken with the aesthetic of Water Seven, I would strongly suggest you take a look at Kozue Amano’s Aria (Tokyopop), which follows gondoliers on Mars. It’s the absolute tonal opposite of One Piece, but manga fans cannot live on crazy hyperactivity alone, and Aria and its prequel, Aqua, are really beautiful. 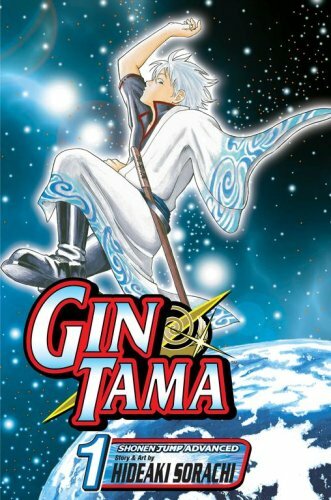 If the goofy humor and occasional satirical bent of One Piece are to your liking and you’d like a slightly more mature (sometimes just coarser) take on them, I’d recommend Hideaki Sorachi’s Gin Tama (Viz). 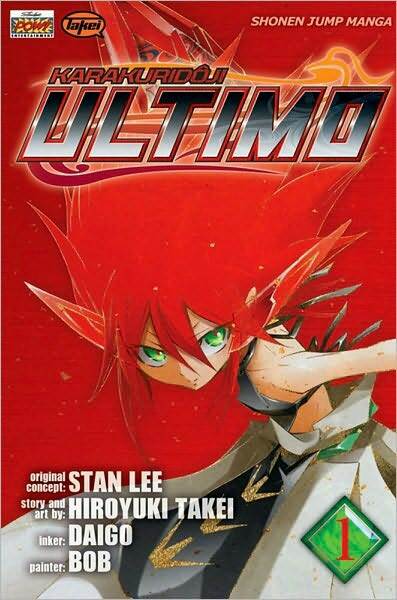 It’s about a swordsman-for-hire living in a world that’s been handed over to greedy, corrupt aliens. Like One Piece, it veers from flat-out goofy to surprisingly serious, and Sorachi does some entertaining world building. If you like Oda’s distinct, detail-packed artwork, give Yuji Iwahara’s Cat Paradise (Yen Press) a look. It’s your basic Hellmouth story – plucky young people must fend off demon invasion while keeping up with Algebra – with the bonus of helpful, heroic felines. It’s not Iwahara’s best work, but his pages are always easy on the eye. 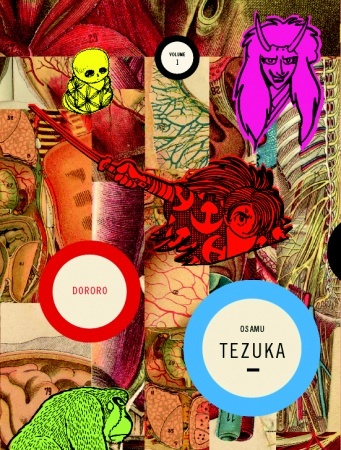 And now we start with shônen I’d recommend under any circumstances, first being Osamu Tezuka’s three-volume Dororo (Vertical). It’s disappointingly short, as Tezuka abandoned it much earlier than he had intended, but it’s creepy, funny, sad and wonderful. The lead character’s father sold his son to demons, part by part, and the kid has to kill all of the demons to get his body back. He hooks up with a young thief along the way. 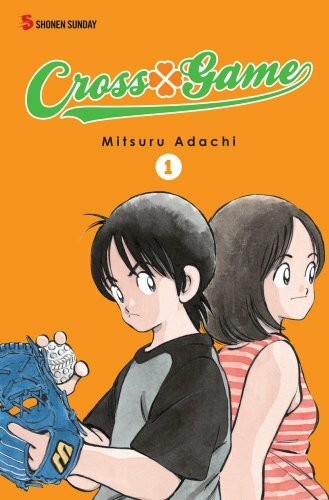 Far and away the best new shônen I read this year and one of the best sports manga I’ve ever read is Mitsuru Adachi’s Cross Game (Viz), which I reviewed here. Beyond being really good in every way, it’s a big, fat package that makes it very gift-worthy. What if you just like stories about pirates? 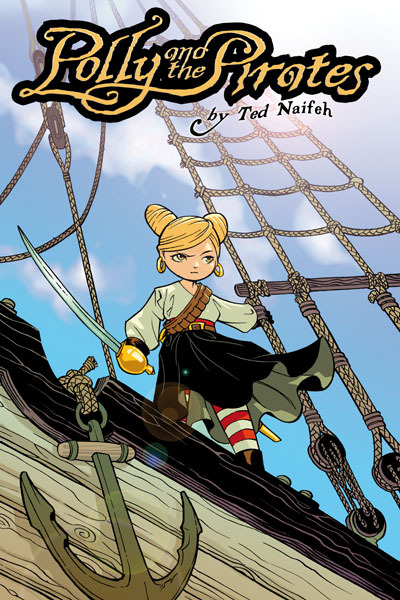 Well, you can’t go wrong with Ted Naifeh’s Polly and the Pirates (Oni). A proper schoolgirl is shocked to discover that she’s got a pirate-queen legacy to live up to in this completely charming, hilarious comic. 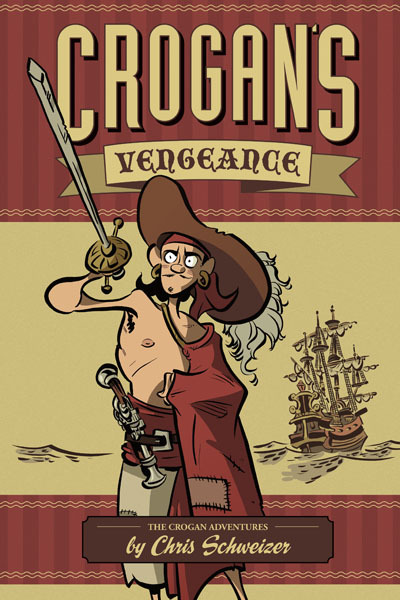 Chris Schweizer’s Crogan’s Vengeance (Oni) takes a more scholarly approach to how pirates actually plied their trade, but it doesn’t downplay the adventure in the process. It’s a smart romp, which I reviewed here. This entry was posted on Saturday, December 4th, 2010 at 8:15 am and is filed under GMGG, Linkblogging, Manga Moveable Feast, Oni, Tokyopop, Vertical, Viz, Yen Press. You can follow any responses to this entry through the RSS 2.0 feed. Both comments and pings are currently closed. Actually, while Kenshin is the most famous series he worked on prior to starting One Piece, he started his career as an assistant in 1994 to Shinobu Kaitani whose Jump series Midoriyama Police Gang ran in the magazine back in 1994. That would have made an interesting license request for the week. Thanks for mentioning it! I’ll toss it into that hopper. W00T for Gintama! So much fun, so ridiculous, so awesome! It doesn’t get much love in the States (or in Japan, seeing as the anime adaptation is currently on hiatus), but it is certainly worth checking out by manga fans. Realistically, I think Dororo makes the best gift: it’s by Tezuka, it’s only 3 volumes long, it was given a stunning presentation by Vertical, and it has a Japanese live action movie adaptation that’s quite good in and of itself. No 200+ anime to catch up on if you want an audio-visual version of the story. Thanks for the gift guide!